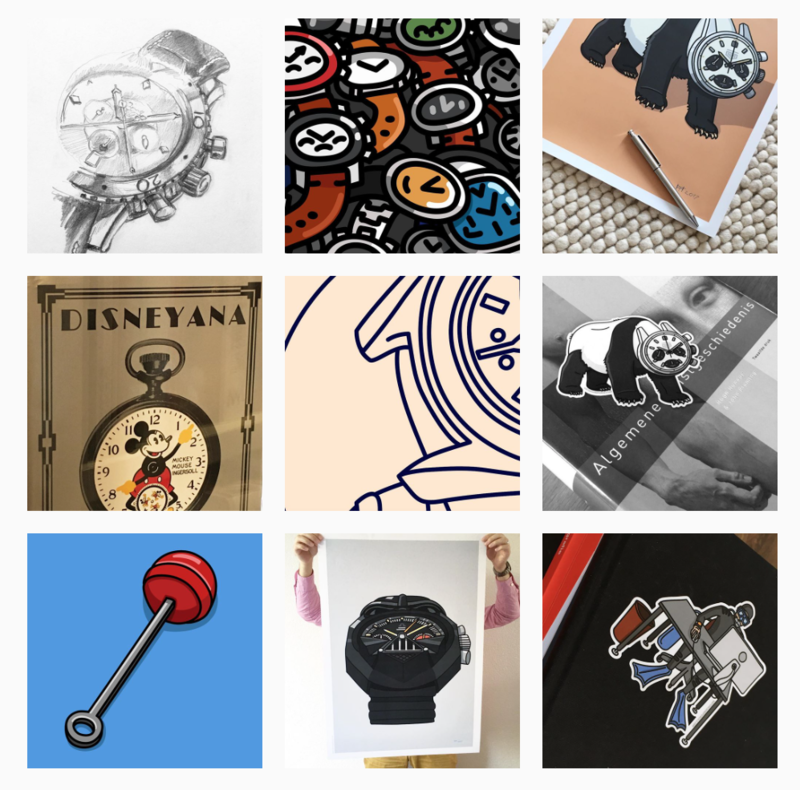 If an illustrator’s quirky designs of horological ephemera is your thing, hit follow on @watchesandpencils. You won’t regret it. Hey Teun, tell us about yourself. I grew up in a small village nearby Eindhoven, where I still live today. Almost 30 years, to be more precise. During my childhood it became clear that I inherited the creative brains from my granny and mum. For a while I went back and forth between game consoles and sketch blocks. When I finished high school I decided to develop and refine my artistic skill set by going to the School of Arts in Tilburg. I finished it and received my bachelor in design. At the moment I’m working as an illustrator and front-end developer at a design agency. Over the years my family and friends taught me to appreciate good design and helped/inspired me to develop my own style. I have a special interest in minimalistic and cartoon-like illustration styles. Humour is very important to me. I love all things that are designed with care, whether it’s a Porsche 911, a Bauhaus chair or an Omega Speedmaster Professional. The last one (watches) I am particularly interested in. Tons of details, the ‘living’ motor and the fact that you can wear it so close by all day long made me fall in love with it. Drawing! Seriously, when drawing, I forget everything around me. The effect of drawing gives a positive boost, tickles the creative brain and resets the mind in some kind of way. A watch is a fantastic object to draw. So many details and shapes. You really discover a piece when you draw it. Ever since I started drawing iconic watches my respect for the big designers has grown immensely. The extra layer in my illustrations makes it even more fun. More about that later on. Besides this, I appreciate a good meal, art-related museum visits, watch-nerd meetings and reading comic books. So, what’s your daily watch and why? A Tudor Pelagos (ref. TN25500) is my daily beater. I’m a true desk diver. I love sport watches without too many polished elements and a splash of vintage character. Form follows function – in essence, a watch is still an instrument. For me it is mainly small, distinctive parts that define a good-designed watch. Not only colours but also good alignment, functional spacing and spot-on proportions. To name some other watches that are in my collection: pre-moon Speedmaster Professional (145.012-67 ST); and a vintage Yema Rallye. I do have a (big) wish list, like most of our watch lovers do. Some are reachable goals, others are not. To name a few random pieces I’d love to own: a vintage Rolex Daytona with an exotic dial (ref. 6241); Seiko Pogue JDM Speedtimer (ref. 6139B); and the new Jaeger-LeCoultre Master Control 25th-anniversary chronograph (ref. 1538530). When I have enough budget to buy a watch, the most important thing is the design in the first place. Although I appreciate a good in-house movement, it is the visual appearance that you are confronted with on a daily or weekly basis. Let’s talk about your business Watches and Pencils – how did that come about? The funny thing is that this idea originates from having not enough time to spend on both passions. So I combined art and watches into one. I named it Watches and Pencils and presented the idea to Robert-Jan Broer (owner of watch blog Fratello Watches). In Watches and Pencils are illustrations specifically for watch nerds. There is a special layer in it. In every piece I try to include a humorous aspect or situation clearly related to the featured watch. Being a watch nerd myself, it’s so much fun to create these pieces. Often my illustrations create a discussion or recognition, which is a nice conversation starter for watch lovers among each other. When you’re creating new pieces, where do you draw inspiration from? Sometimes an idea just pops into my mind. Other times I generate ideas after reading (watch) related articles. I have a few basic concepts and alter between them: brand-specific illustration; watch-model-specific illustrations; typical watch terms; or opinionated illustrations based on watch news. I keep track of all the ideas on a personal list. It’s still growing every day. The last method is one I especially like – direct requests from the watch-loving crowd. Now and then I ask people or, at best, people just come to me with an idea. I listen to my followers and always try to involve them. In my opinion my illustrations/art works best with direct input from watch nerds. In case you have an idea or request, you can always contact me! How are your pieces actually created? Let’s talk about that process. The process can be divided in several steps and almost always starts with searching images about the watch and objects in the specific setting. Based on what I’ve seen, I start making old-school analog sketches and start forming my interpretation. When the sketch is completed I scan it and use it as a blueprint/guideline for my digital illustration. Then the long process of drawing the lines start (in Adobe Illustrator). Sometimes I refine a line several times until I’m satisfied about the characteristics and definition. Once the lines are drawn, I start adding colours to the scene. Colours are very important to me and I always use a predefined palette. Balance and harmony bring life to the illustration. The last step is adding the shadow and highlights, often made out of lighter and darker tones from the colours in the illustration. And you’ve just launched a website – how long has that been in the making? For quite a while! I received a lot of questions from people who wanted to buy my illustrations and artwork. Also from other people, who wanted to give something watch-related to their watch-loving friend. The shop is my answer to all the questions. Now people can easily buy the most popular signed prints, stickers and screensavers of my artwork. I ship over all the world. I handle and sign orders myself. This is a personal touch and keeps things a bit exclusive. Tell us about your monthly feature with Fratello. What does that involve? This actually goes one step further than an illustration. Every month I create a new episode and write a full story around the topic or watch that is featured in the artwork. Often a design breakdown of the featured watch is included. For example, the famous Rolex Submariner or an Omega Speedmaster. It’s a nice blend between creativity and information and it’s a popular feature on Fratello Watches. Already 30 episodes have been launched, and there are more to come. Which is your personal favourite piece that you’ve created? That’s a difficult one. I do love the Speedmaster-related ones, but that’s mainly because I love this watch so much. From a technical point I would make a different selection. Omega Darth Vader, Seiko Turtle and Offshore Rainbow are pieces I’m proud of. Perspective, colours and characteristics were a true challenge on those ones. Sometimes more than 25 hours of development were involved to come to the final result. And finally, are there any other artists in the watch space that you admire? Yes, there are. I see other artists as friends, and now and then we inspire each other. Some artists I’ve met in person and others I only know ‘digitally’ by Instagram etc. Some artists I do have respect for: Cay Brøndum (Historic Horological Art), Onehourwatch, Sunflowerman and Julie Kraulis.